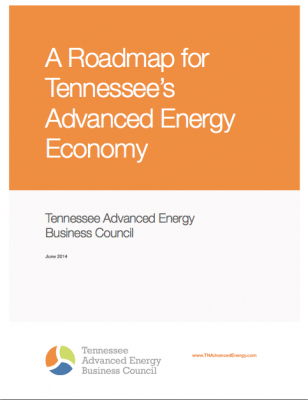 This information comes out of a document that TAEBC created called A Roadmap for Tennessee’s Advanced Energy Economy – and there’s a lot more to it than the features listed above. There is increasing evidence that Tennessee’s advanced energy sector is poised for a period of sustained growth. TAEBC was created to help facilitate this growth by championing the use and manufacture of advanced energy technologies as an economic development strategy. With an overview of the existing companies and research institutions in Tennessee that together form the foundation for continued growth of the design, manufacture and installation of advanced energy technologies, the Roadmap for Tennessee’s Advanced Energy Economy seeks to provide the context for decisions by business and government leaders that could make a lasting contribution to Tennessee’s economic base over the next decade. TAEBC’s goal is to help business and government view Tennessee’s advanced energy assets as an emerging sector that will play an increasing role in the state’s economic development. The Roadmap provides an overview of Tennessee’s economy and energy assets, a window into innovations that might transform the advanced energy sector, opportunities for greater energy efficiency, and a number of conclusions that TAEBC hopes will contribute to a discussion about how best to promote the growth of advanced energy technologies in Tennessee. The Energy Technology and Environmental Business Association (ETEBA) hosted the Tennessee Advanced Energy Business Council’s (TAEBC) Cortney Piper during its monthly dinner meeting on August 28 at the Holiday Inn Cedar Bluff in Knoxville. Piper spoke about the Tennessee Advanced Energy Business Council and its mission to promote advanced energy as a job creation and economic development strategy. Piper presented the TAEBC Advanced Energy Asset Inventory and solicited feedback regarding the best ways the organization can foster the growth of our state’s advanced energy technologies, companies and jobs. She gave an in-depth explanation of TAEBC’s mission, plus how the organization promotes that mission through roundtables, listening sessions and other events. Attendees asked stimulating questions about what the Federal government is doing to help Americans save money through advanced energy. Piper explained that Executive Order 13514 authorized the Federal government to enter into a minimum of $2 billion in performance-based contracts in Federal building energy efficiency. Individual agency sustainability plans are available here. ETEBA is a non-profit trade association representing more than 250 small, large and mid-sized companies that provide environmental, technology, energy, engineering, construction and related services to government and commercial clients. Its mission is to promote the success of its members by fostering market understanding, identifying business opportunities and advocating for our common interests. TAEBC hosted a variety of companies including Nike, FedEx, Lallemand American Yeast, Jones Lang LaSalle, Thompson Power, Siemens Medical and TRANE as well as companies from across the state to discuss the future of distributed generation in Tennessee with Joe Hoagland, Vice President of Stakeholder Relations, TVA. Joe Hoagland discussed how to model and understand clean energy opportunities from a utility perspective and provided some insight on the future of distributed generation in the Valley. One thing is certain: distributed generation is gaining in popularity and will continue to grow as part of the region’s energy future. Commercial and industrial users are interested in low cost, cleaner energy that has high reliability and are exploring distributed generation sources as one way to help achieve these goals. Yet as distributed generation evolves, it creates challenges to the overall grid system to continue to be low cost and reliable. So, a key challenge for electric utilities is determining how to respond to marketplace demand for distributed generation while maintaining high reliability and competitive rates. That’s where your input comes in. Joe Hoagland and TVA encouraged all end users to use him as a resource, in addition to the online resources such as the draft IRP expected in Spring of 2014. 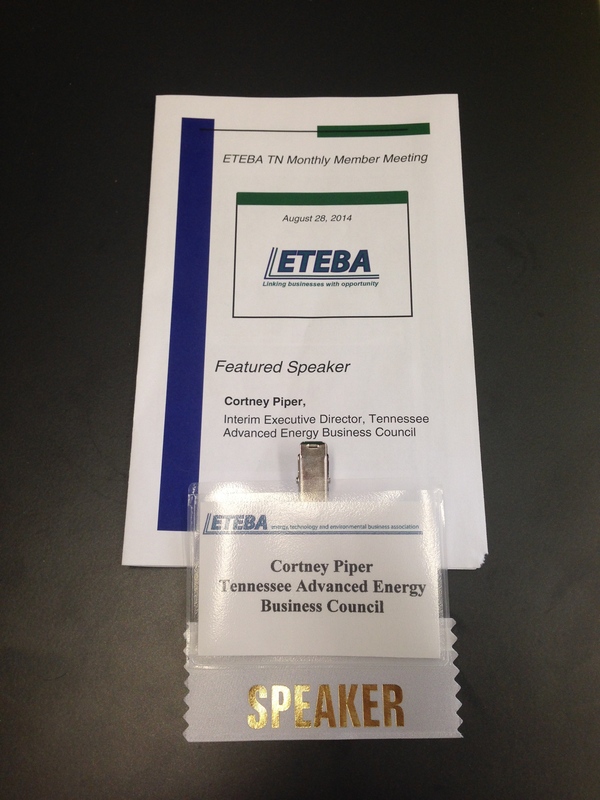 TAEBC will also continue to partner with TVA for in-person listening sessions in early 2015. Stay tuned! For a copy of the webinar presentation, click here. A big thanks goes to Knox County Mayor Tim Burchett for being our featured guest during a recent Tennessee Advanced Energy Business Council (TAEBC) listening session with Knox County manufacturers. Major manufacturers in Knox County representing more than 2,500 jobs met last month to talk about energy challenges and opportunities. TAEBC representatives shared more information about who we are, what we do and how we might be able to work together to assist our manufacturers in gaining more control over their energy costs. Take-aways from our roundtable were not surprising: Yes, there is a need for greater grid resiliency, and manufacturers are increasingly looking for ways to manage energy use and costs more efficiently. 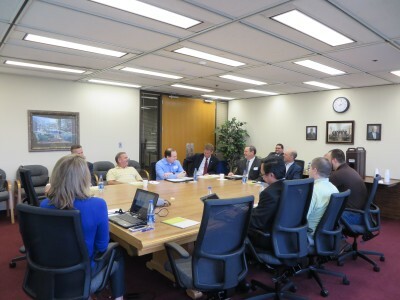 There was certainly interest for TAEBC serving its education and connection functions through expanding its Asset Inventory and connecting our research assets and successful manufacturer energy efficiency case studies with Knox County manufacturers to deploy advanced energy technologies. 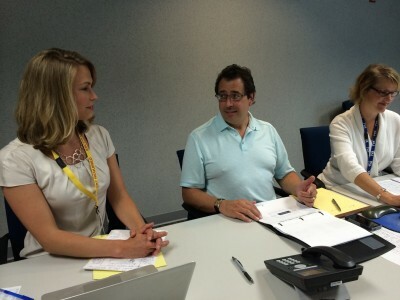 TAEBC will continue to work with its members and partners to determine how it can best connect our advanced energy assets to seize opportunities that will make our manufacturers more competitive by gaining more control of energy costs. In some recent posts, we have elaborated on Tennessee’s high per-capita energy consumption and a gap in personal income. The final part to this series is discussing the potential of three major players – and explaining who they are. Initiatives from three distinct components of Tennessee’s economy – the Tennessee Valley Authority (TVA), Oak Ridge National Laboratory (ORNL), and the automotive sector, including the massive assembly plants of General Motors, Nissan and Volkswagen – will have a disproportionate influence on the direction and success of the state’s efforts to promote an advanced energy economy. The ability to understand the assets that these three major economic players bring to the discussion, as well as their willingness to combine these assets in support of advanced energy technologies, will to a large extent shape the opportunities for sustained expansion of the advanced energy economy in Tennessee. While the automotive sector represents what may be the single largest opportunity to expand the use of advanced energy technologies, significant opportunities also exist within other key clusters in which Tennessee, because of geography and a mature industrial base, has a competitive advantage. Examples include logistics, transportation and distribution services, chemical products and plastics, and advanced manufacturing. Since its creation in the 1930s, TVA has played a major role in the growth of Tennessee’s manufacturing base and, more recently, in efforts to reduce the volume of sulphur and carbon emissions in the state’s air. TVA’s mission includes use of the agency’s resources to improve environmental quality and foster economic development. The scope of TVA’s energy portfolio makes it possible to pilot, incentivize and evaluate a variety of innovative clean technologies. Increasingly, Tennessee’s inventory of advanced energy technologies is the beneficiary of breakthrough discoveries and initiatives at ORNL, the nation’s largest energy research institution, and the University of Tennessee. The Laboratory is at the forefront of innovation for biofuels, energy storage, solar technology and nuclear power. A close relationship with the University of Tennessee has resulted in the Laboratory becoming a vital part of the state of Tennessee’s economic strategy with successive governors. In many respects, the initiatives of both TVA and ORNL are responsive to efforts by Tennessee’s automotive manufacturers to promote advanced energy technologies, both in their products and in the operation of their manufacturing facilities. In Smyrna, Nissan has made a historic investment in the design and manufacture of batteries and electric cars in Tennessee. In Chattanooga, Volkswagen operates Tennessee’s largest solar park, where 13 million kilowatt hours are produced annually to power 12 percent of the enormous manufacturing facility. [i] Each of Tennessee’s automotive manufacturers is looking over the horizon to innovative technologies and materials such as carbon fiber that will reduce weight and increase fuel efficiency. The last decade has witnessed a growing willingness among the three major entities in Tennessee’s energy economy to partner in the deployment of innovative technologies. TAEBC views the ability to replicate this kind of cooperation as a key factor in expanding Tennessee’s advanced energy economy. [i] 2012, August 29. Work begins on $30 million solar park at Volkswagen. Chattanooga Times-Free Press. Retrieved from http://www.timesfreepress.com.